The Check Data action allows you to move Subscribers in the workflow to separate branches based on the value of a Data field assigned to a Subscriber. If a Subscriber Data field matches, they will move down the Yes branch of the workflow, and all Subscribers that do not match the value will move down the No branch of the workflow. Table: Required listbox to select the Table containing the data to compare. You can choose to check data from the Subscriber Data table, Custom Data table, or a Relational data table. Type of Compare: Required listbox to select the comparison operator. Value to Compare to: Required textbox to define the value to match. The value can be a string, number, float, or date depending on the type of the data field selected in the Column option. If Type of Compare is set to 'Is Between' or 'Is Not Between', two fields will appear for Values. If the Type of Compare is set to 'Is Blank' or 'Is Not Blank', the Value field will not appear. Drag the Check Data action to the workspace. Click the action to display the Check Data popup. Select the Table that contains the data to compare. You can choose to check data from the Subscriber Data table, Custom Data table, or a Relational data table. Once selected, the Column listbox is populated. Select the Column containing the data to compare. Once selected, two additional options appear. 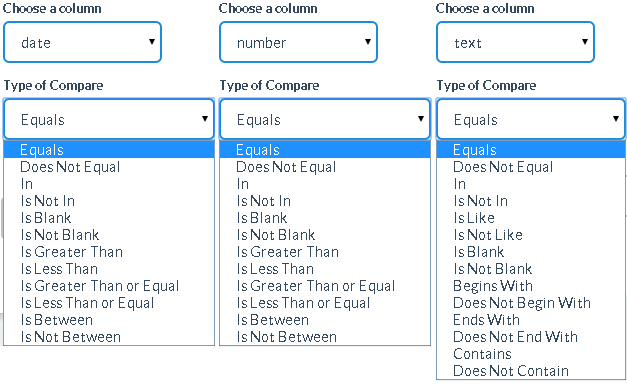 Select the Type of Compare, or data comparison operator. If the Column is a Date and you select is Between or is Not Between, a second Value field will display. Enter a Value to Compare to. The value can be a string, number, float, or date. It must match the data type of the selected Column. The saved Check Data action will appear in the workspace with the Table name, Column name, Operator, and Value displayed in the action details. If the Check Data action options have not been defined, it will appear in the workspace with a red border. Check Data Table is a required field. Please select a valid table. Check Data Column is a required field. Please select a valid column. You may only select data comparison operators that support the data type of the selected Column. The comparison Value must be of the same type as the selected Column. 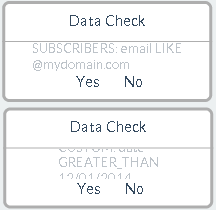 Move Subscribers that match the Data Check to the Yes output path. Move Subscribers that do not match to the No path.